Here's my completed Windmill and Flying Geese Quilt. I had a great time using my just my walking foot to quilt it. I especially like what transpired in the large rectangles of negative space. There are 3 rows of symmetrical stitching 1/2 inch part from the base of the block extending upward to the center of the top. The block still looked too empty with just the 3 quilted triangles. So I added a single triangle pointing downward which meets the point of the inner most upward pointing triangle. The asymmetry this creates reminds me a bit of designs from the Prairie School from the early 1900s. This is a fun quilt to make. I'd like to try it again with some bold bright solids. 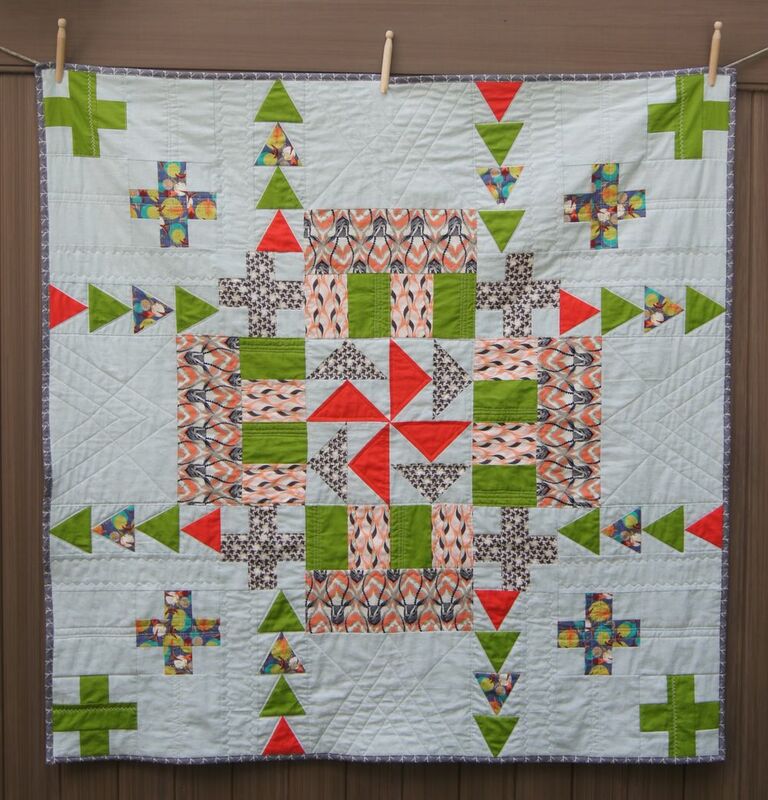 The free pattern for this Windmill and Wild Geese Quilt and is posted under Patterns in the header above and by clicking the link in this paragraph. Around the World Blog Hoppers: If you've backed up the chain to my blog, Welcome! My post Around the World Blog Hop post was last Monday. Scroll back 3 posts to read it and enjoy my posts on the way. So glad you stopped by and come back soon! Blog News: Based on the feedback of my readers, I going to try posting twice a week rather than Monday, Wednesday and Friday. Folks tell me they like the content but think reading it three times a week is a lot to keep up with. I'm not sure yet which are the best two days to post. Please weigh in and let me know which days you'd like to see new posts from my blog! Leave me a message about your preference in the Comments below. Thanks! I'll let you know know next week.